40 ct. Fawn by LL, DMC threads (1 over 2). I also decided to start something new (having my own belated January challenge). :) I decided to start "Rose Quaker Sampler" by Wiehenburg. I was going to use NPI, but ended up going with DMC because I wanted to make sure I had enough and not have to worry about dye-lots. 40 ct. Vintage Magnolia by LL, DMC threads (1 over 2). Another goal for 2011 that I have set for myself is to stitch an ornament a month. I realized when putting my ornaments on the tree last year that I only had a couple stitched by me. 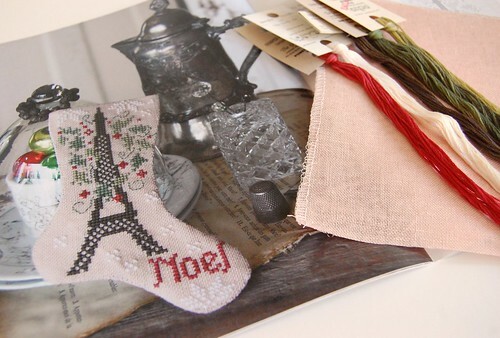 So the first ornament I want to stitch is "Souvenir of Paris" by Blackbird Designs. 30 ct. St. Valentine's Blend by R&R, GAST and WDW threads. I never should have stopped by here. Now I want that Rose Quaker sampler. I NEED that Rose Quaker sampler! Sigh. It's going to be beautiful. Margaret is coming along nicely. Beautiful stitching! Rose Quaker Sampler is quite the challenge. I can't wait to see your progress as you stitch. I had set today aside for a whole day of stitching but alas...it is noon and I haven't picked my needle up yet! I have been blog cruising and baking sweet rolls...YUMMY on both accounts! Nicole, I just love your blog. You so inspire me. I don't know how many times I have started at the first entry and re-read the whole thing. I could look at your stitching for hours. How many pieces do you have started? I just started my own blog. 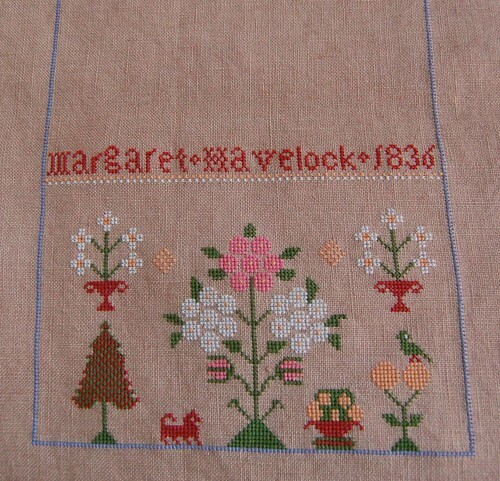 Love that Margaret Havelock Sampler. I love samplers period. Thank you for sharing your progress. It keeps me motivated. Guess I am going to have to start one of my Quaker samplers soon. That Rose Quaker Sampler is beautiful! Margaret is coming along beautifully! 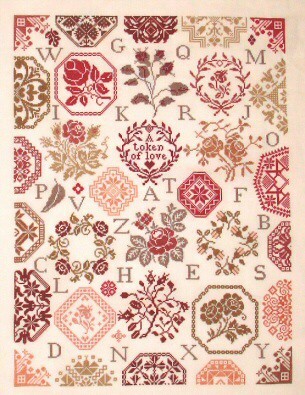 Love the Rose Quaker sampler. I may need that one. Fun, fun projects!!!!! I am stitching that stocking too but I am not even attempting the finishing, LOL. I will send my stockings off to Deb :-). Great stitching! Always love to see what you are working on! Margaret is looking great so far. And that Rose Quaker is going to be stunning! I just started Isabella Johnstone 1854 last night and I am already addicted! Can't wait to get home from work to stitch on it! Margaret is looking great! Oh no, you started Rose Quaker. That means my resolve will probably break. I've loved it since it came out! Beautiful start. Good luck with your BBD stocking! Just beautiful. I love your choice of samplers and your work is outstanding. I admire you for being able to start so many samplers. Enjoy!! Your progress is beautiful!! Love it :) The Rose Quaker is sitting in my stash bin too-- will look forward to seeing your pics on her!!!! Gorgeous, all of it! I hadn't seen that BBD Eiffel tower stocking - how adorable!! Oh you're killing me!! lol! I love all your projects -- so pretty!!!!!! Looks like you are having your own "crazy challenge". You've got some great projects started... happy stitching. 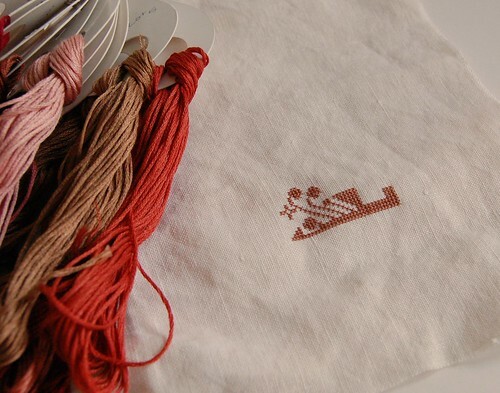 I always have such photo envy when I read your blog - beautiful photos of beautiful stitching! Lovely stitching as usual. Beautiful start on Rose Quaker. I have this in my to-stitch list this year though I've still yet to pick out the fabric for it. Can't wait to see more progress. Both pieces are beautiful, such pretty colours! Margaret looks lovely !! 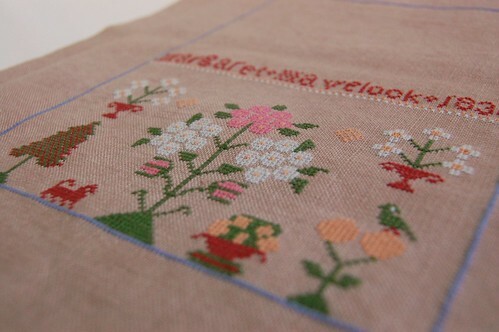 I love the Rose Quaker sampler also.... Good job ! I love the first one, very very nice colors ! I just love Margaret's colours, Nicole! And this Wiehenburg sampler you've started has got to be my favourite Quaker ever. Good luck with those ornies! Nicole ~ Margaret is looking great ~ I ran out and got the materals for her (-: I can't wait to start. Fine stitching and great progress. Just love the colors of Rose Quarter! Started collecting the stockings - can't wait to hear your feeling about the finishing of one! Love love love that Rose Quaker. So pretty! I'm planning on doing an ornament a month this year too - I need more stitched ornaments on my tree!